I am thrilled to be able to blog this Lakeside Wedding, styled shoot we did for the Calgary Bridal Guide! For this shoot, we were given colors and asked to design a shoot around the colors. The colors were greys and neutrals and a deep red. I couldn’t help but think how neutral colors work well in a natural setting, so I took inspiration from nature…rocks, twigs, and the beautiful setting of the rocky mountains! My mind was set on a lakeside wedding inspiration and I sought out ways to incorporate the color scheme into an outdoor, natural setting! For this shoot I was teamed up with the very talented Rafal from One-Edition: Weddings by Rafal Andronowski Photography. We both did a little scouting around and agreed to shoot at either Lake Minnewanka or Two Jack Lake. On a windy, overcast spring day, my husband Don and I met up with Raf and decided to set up our little shoot on the picturesque shores of Two Jack Lake in Banff National Park. Raf took all the stunning photos you see here! Lakeside wedding inspiration by Naturally Chic: photo by One Edition: Weddings by Rafal Andronowski. One of the things I love best about the mountains are the numerous lakes, rivers and streams. I’ve always loved spending time near (and in) the water! For me, lakeside = summer! In fact, water and the mountains are a huge part of the mountain (and Canadian) culture and the perfect setting for this wedding inspiration! Your wedding invitation is one of the first indications your guests have as to the type of wedding you will be hosting. For this shoot, I really wanted the invitation to reflect the “wedding” locale! For these invites, I used a real “driftwood” looking, wood veneer, some natural hemp twine and some small pebbles to reflect the lakeside setting! A little whimsy, for a casual wedding is always good, so I had a little fun with the reply card! I love neutral colors because of how easily they can be incorporated into natural or rustic weddings, but a pop of color can really complement neutral tones! For this shoot we were teamed with the immensely talented Sarah Mayerson of Sarah Mayerson Design. Sarah’s designs are always so incredible and I couldn’t wait to see what she would do with the long piece of driftwood I brought her. I had really wanted a long, low design for the centerpiece so as not to detract from the beautiful mountain scenery and I thought that using the intense red color would provide the perfect pop of color. As usual, Sarah’s centerpiece design was a show-stopper! The peonies, rununculus, succulents, pods and spanish moss are stunning in this beautiful arrangement! Naturally Chic lakeside wedding tablescape for Calgary Bridal Guide, with Sarah Mayerson Design and photos by One-Edition: Weddings by Rafal Andronowski Photography. For this shoot, I also included a small cake and favor table. I used rustic wood risers we made from reclaimed wood and filled the table with cake and sweets. One of my favorite DIY additions was the flag bunting. I made the bunting from canvas that I cut into small flags and hand-painted with stripes and dots for a lakeside feel. I also made large wood letters to represent the “couple’s” initials. Thanks for visiting! 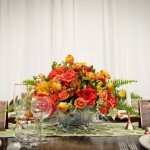 Please stop by again as we will be posting all the details of our tablescape! You can also check out the latest edition of the Calgary Bridal Guide, on newstands in and around the Calgary area for more photos from this shoot! Wood veneer, lakeside wedding menu by Naturally Chic. Photo by One-Edition: Weddings by Rafal Andronowski Photography. For more information about our planning and design services visit us at www.naturallychic.ca or contact us at hello@naturallychic.ca or call 1.888.679-9056. I am so thrilled to blog about Noorin and Asif’s wedding! Okay, the truth is this an overdue post, but better late then never right? Noorin and Asif are such a perfect couple! After 10 years of being together, often living apart in different cities, these two were finally married last year. I love that these two have a such an amazing connection together and they wanted their wedding to be be personal and meaningful! When I started working with Noorin and Asif, it was evident that Noorin had a very clear vision of what their day was to look like. After the couple spent time at the Fairmont Banff Springs, Noorin knew this was where she had to be married. From the start she had a vision of the style and feel she wanted from her wedding. Our job was to bring that vision to life and to hopefully add a little too! Noorin and Asif’s wedding was actually a three day affair taking place in Calgary at the Royal India and at the Fairmont Banff Springs. The couple chose to do a Western ceremony in Banff because they wanted their ceremony to be very personal and representative of them as a couple. In Muslim weddings, vows and rings are not exchanged. The couple chose to blend both the Western and cultural traditions together. Noorin’s family is Ismaili Muslim, while Asif’s is Sunni Muslim. They wanted to ensure that all of who they are, was reflected in their special day. The couple’s attire reflected both their cultures and despite having a “Western” ceremony, they made sure to include plenty of cultural traditions as well. I loved their vibrant colors! From the start, Noorin and Asif wanted to make sure that their family and friends were having a good time and well taken care. The couple had guests come in from all over the world, and many of them had never met. Despite not having met previously, the sign below echoed the sentiments of the couple, that they would all soon be one family! The couple wanted to have special reserved seating signs for their very special family members. I love that instead of just the name of the person, their signs had affectionate sayings depicting the guest. Mirrored reserved seating signs by Naturally Chic | photo by Yeuko Image. “Reserved for our Lovely Mother” was one of the sentiments engraved into the mirror. Aside from how beautiful everyone was dressed, one of the favorite parts of Noorin and Asif’s ceremony was that they each wrote special vows to read at the ceremony. Their vows were some of the sweetest vows I have yet to hear. It was so evident that the couple have a deep affection and love for each other. They even asked if I would engrave their vows onto two mirrors so that they could hang them in their house afterwards as a constant reminder of their love. One of several cultural elements incorporated into the ceremony, was the breaking of clay plates. The plates were filled with lentils, silver, sugar and tumeric which represented nature, wealth, sweetness, harmony and good health. The one who broke their plate first while stepping on them was the supposed “ruler of the household”. Not coincidentally, they broke the plates at the same time. Not coincidentally because they are both so respectful of each other (including Asif’s respect for all of Noorin’s shoe purchases :). The couple exchanged gifts with their wedding party and family during the ceremony. After the ceremony guests enjoyed champagne, chocolate strawberries and other appetizers. Stay tuned as tomorrow we will share Noorin and Asif’s reception! To see the first day of their celebration head over to Yeuko Image’s blog as there are some amazing photos! 2013 Flooding in Southern Alberta and Your Wedding: What to Do? The recent events in many parts of Southern Alberta are a strong reminder of how powerful Mother Nature is and how extreme weather can wreak havoc on your wedding day plans. Your wedding day is supposed to be one of the most important and special days of your life, so what do you do when the unthinkable happens and extreme weather forces you to alter your wedding day plans? While I don’t pretend to have all the answers, I couldn’t help but think of all the couples who have weddings planned for this weekend (or in the very near future) in any of the areas in Southern Alberta currently affected by massive, and widespread flooding. I have no doubt that many of you are uncertain as to what to do next and are scrambling to make alternate plans, or to make the decision to postpone your wedding. The reality is that many couples will have to to do just that. There are entire areas of Southern Alberta including, Calgary and Canmore that are still in a state of emergency. The damage and devastation is wide spread. We also do not fully know the extent of the damage or how long clean up efforts might take. To put things into perspective, this is the worst flooding Calgary and many surrounding communities have ever faced. The property damage and loss will be substantial. It’s estimated that over a hundred thousand people have been evacuated from their homes and immediate aide of food, supplies and personal effects are needed. People in some hospitals and seniors’ homes have been evacuated and relocated from flood affected areas. Families with children have been displaced from their homes. Many people who have not been displaced, are without power, gas or water. There are even people who have lost or at risk of losing their homes. I can’t even imagine what these people are going through right now. Sadly there has even been a tragic loss of lives. I don’t say these things to cause alarm or frighten anyone, but what I do know is that many couples and their guests are coming in from all over the globe to be married in Calgary and the Canadian Rocky Mountains areas of Canmore, Kananaskis, the Town of Banff, and surrounding areas in Banff National Park. Many of these people simply are not aware of the magnitude of this situation. While our care and concern is for everyone’s safety (including our pets and animals), and our hearts and prayers go out to all those who have been affected by the flooding, as wedding professionals we also know how important your wedding is to you and your families. It is supposed to be a once in a lifetime, special occasion for you, your families and your guests to enjoy. You have invested much time and money into crafting the perfect day for you and your loved ones to enjoy. You have potentially taken time off work and have guests flying in from all over the world. Many people have put in a lot of hard work and sacrifice to make your day happen. Maybe you are facing pressure by some individuals for you to cancel your wedding, while others are encouraging you to go ahead with it. What should you do? No doubt you are experiencing mixed emotions (and we can’t say we blame you). How do you proceed with what should be a joyous occasion when many people around you are displaced or hurting? What is happening all around is disheartening for everyone, let alone someone planning their wedding. Not only that, you’ve never planned a wedding before and you’re not sure what to do next. If your wedding is this weekend and the venue is flooded or inaccessible, then you may have no choice but to relocate or postpone it, but what if your wedding is in the coming weeks? Unfortunately, there is probably not one clear cut answer as every wedding and situation is different. As well, the situation is changing daily and thankfully, it appears we have now turned a corner and can, with great hope, focus on rebuilding. Regardless, you will have to make a personal decision on what you will do with what you have available to you. So what do you do? You have invested substantially both financially and in time, and you have signed contracts with all of your wedding professionals. The first thing you need to do is speak with them and see where things are at because every situation is truly different. Keep in mind, that many of your wedding vendors may be affected by the recent events. Don’t be alarmed if they are not able to get back to you immediately (I personally know of several wedding professionals who have been displaced from their homes, many of which were not even home at the time their homes were evacuated. There are even a few who are at risk of losing their homes. Power and internet is intermittent at best for some – one of the reasons this post has taken me so long to get out! Things have changed rapidly, and I’ve had to rewrite it several times!). My best advice is to be patient. Caring and understanding can go a long way when you do reach your vendors! You will need to speak with all your wedding professionals including your wedding venue and / or caterer, planner, photographers, dj or musicians, florists, rental companies, cake person, transportation company, and anyone else involved in your wedding. If you have a planner, they are a good person to contact first as they can help guide you through the process of what needs to be done. Aside from your planner (or if you don’t have one), contact your wedding venue first. Undoubtedly you have substantial financial investment with them. You need to know if they are operational. You need to know who is still available to help you and who (for various reasons) may not be able to help. Another point you need to keep in mind is your legal contracts with the various wedding professionals. Most professionals will have a “force majeure” clause in their contract with you (which is loosely translated as a “great force”). Most commonly, this clause is used with reference to “Acts of God or Nature”. Contracts vary, but some contracts may state that they (the vendor) cannot be held responsible for such acts. This may mean that they physically are not in a position to help you (ie. the venue is flooded out or has no power making it impossible for them to host your event) and unless you’ve purchased wedding insurance (which is a good idea), you could still be responsible for fees owed. The contract should spell out exactly what will happen to fees you have previously paid, and the money you owe in the event that this clause must be executed. Hopefully, all your vendors will be equitable, reasonable, flexible and compassionate where they can be (We have an amazing wedding industry in Calgary and the Bow Valley and many professionals have already been working together to do whatever they can to ensure beautiful weddings for their clients), but keep in mind some vendors may have to, for various reasons, execute the clause. In many cases the clause is there to protect you as the client too. In any event, you need to discuss your contract with the vendors, assess what can and can’t be done, and then come up with a viable action plan. You may need to negotiate with your wedding professionals. But again, keep in mind some businesses may be hurting themselves! Negotiation needs to be fair (and a hopefully a win / win) for everyone involved. This may mean you have to make concessions. Perhaps this means having a buffet dinner instead of a plated meal (because a the venue cannot physically staff enough people to serve you a plated meal), or that you may have to have your wedding during the week instead of on the weekend. Perhaps this means that you will have to forego the special lighting and fancy linens coming in from out of town, and use the venue’s linens instead. Perhaps this means that you have to purchase cupcakes from the grocer down the street or that you will have to work with replacement vendors. Whatever it may mean, you have to figure out what’s possible, what will work, and more importantly, if you are okay with it? Will this mean your wedding will be rescheduled to another date, relocated, or still happen but in a reduced capacity? After consultation with your vendors (and perhaps after further discussion with your family, guests or other stakeholders), you will need to make a decision. Is the wedding still possible, however altered it may be? Perhaps you will be pleasantly surprised to know that it can go off exactly as planned (we can hope right?) More likely, you will have to make some changes or concessions to your original plans. Have you weighed the pros and cons of your decision? If you do decide to go ahead with your wedding, whether it be at your original venue, or an alternate one, your number one priority should be the safety and well being of all your guests. As mentioned, every situation is different and you will need to be realistic and reasonable in all your decisions. Whether you or a bride, groom, or wedding professional, please feel free to weigh in with your thoughts or share your experiences in the comments. We wish everyone planning a wedding during this difficult time, all the best! Please know your wedding community is still here for you! **PS if your wedding is not in the next upcoming weeks, you may want to touch base with your wedding vendors, but please be patient as they may be dealing with more immediate weddings.